I hate the word "Apps"
There are many words that I despise, too many to list here. You can feel safe from any of my ranting and proceed to read the post You are going to read it, right? So, I am stuck on a name for the "app" (yuck) though. Any suggestions? Hehehe, as if I could build a program or application for anything. I can barely program our coffee maker. But otherwise I am sorta smart, really. Really really! Or as say we say in Massachusetts "wicked smaht". Unfortunately this sort of smahtness has only qualified me to smash (crush!) friends and family at any kind of trivia or word game. They hate me now and refuse to play with me. It seems as if I am fishing for compliments (i"m not, actually) as well as bragging a little. But, well. I have to have something! to brag about! You are wicked smaht Kathy. Trivia is your specialty based on all of your wicked smaht blog posts. Now for an app, that renames application to some other word that means application. So all dating apps would be dating implementations. So, I am stuck on a name for the "app" (yuck) though. Any suggestions? Siege the date, that’s pretty good! I’m kinda interested to hear what Rusks entry would be. Dislikes: Everything, especially green goblin snotballs and paying customers. Rusk, heh, he seems to be the type of guy who likes taking in the scenery (the floor under his bed), short walks on the lake front after drinking all the ale in Etan's Roost. That's when he goes flirting with a skrubb, whom he refers to as "Judy". 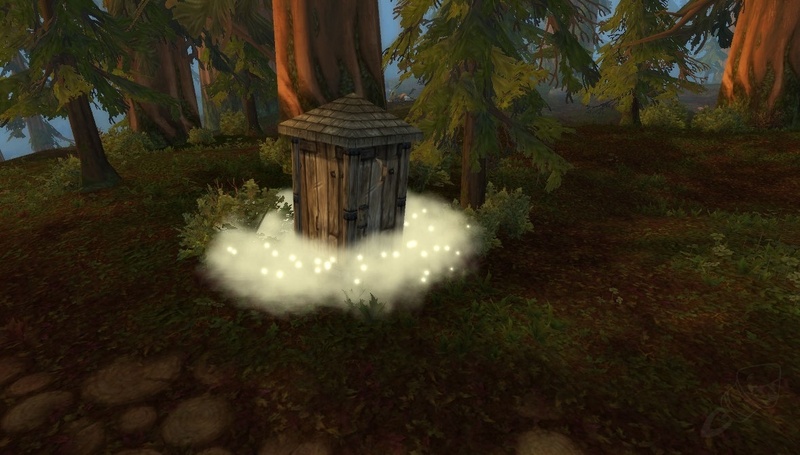 You know, as I type this it occured to me that I have never seen a bathroom, outhouse or any other kind of place in Dungeon Siege for people to go pee. What happens when a tavern customer, such as Rusk, rolls up and drinks two or three gallons of ale. Wouldn't he then have to "go"...but where? And also, why am I even thinking of this? Not too smaht now, right Elfy? You're right there are no bathrooms, outhouses or other places for people to go pee in Dungeon Siege. There is also no toilet paper or porta-potties for sale in any of the shops! You can pee behind a tree, but where does one poop. I know I know, the restrooms are behind all those doors that can not be opened! That's the hole left by a Skrub after a dwarf comes along and makes the skrub into Chowder while looking for Bone Minions.......Must Destroy all BONE MINIONS!!! Ooh! I want both a toilet paper roll to throw at enemies and a matching shield. Preferably 2 ply, for extra shieldy power. DE, you played WoW. Did you read the forums? People would post the same types of questions every so often about the bio issue, partly because Blizzard does enjoy giving out the occasional (sometimes more than occasional) poop quest. Or they used to anyway, I haven't played for a couple of years. Alrighty then. On *that* note, I'm going to go wash my hands. Several times. Our adventurers, of course, never need to poop because they hardly ever eat solid food (as a villager in Elddim once remarked on), getting all their nourishment from potions instead. Goblins in Dungeon Siege are more technologically advanced then the other inhabitants of Ehb, so that's probably why they have a bathroom. As for the treasure being stored there, the gobbos may have book smarts but little common sense. Who knows what really goes through those little green brains? Visions of Sugar Plums? I think not. Our adventurers might never need to poop, but I kind of think they could use a bath every so often. Running around in plate or leather for days on end would have to make a person pretty rank. I guess the mages would be okay since they could use spells to whisk away the grime, but those melee types must sweat like crazy. Oh well, the life of an adventurer can never be easy I guess, such a burden to bear. I guess when the adventurer gets really stinky and grimy they could find a lake with a sandy beach, remove their armor. Jump in the lake then rub themselves down with sand and then rinse off. That should remove the grime, stench and possibly some skin. Removing some skin should not be a problem since armor tends to rub you raw even when you wear a leather jerkin. (I know this from experience). Then to you could always have a nature mage in your party that could not only have healing spells but a remove armor spell, a remove stink spell, and a remove grime spell. Just a few ideas for shiny squeaky clean adventurers. Sand doesn't remove skin, it exfoliates helping to create a smooth complexion. Exfoliation is super important and one needs to get a hold of the best products. Find a really back to nature Nature Mage to brew you up some special potions and to research the right sort of "wellness" spells for you. Remember, it's important to emphasize the word Wellness, apparently it's the thing to say in these situations. There's no excuse for skimping over health and beauty care, no one cares about dumb excuses. "There aren't any bathrooms except for the goblins!" OR "Oh, I'm busy out saving the world, wah wah wah." Get over the goblin's prying little eyes and remember...the world can wait, an adventurer's beauty regimen just CAN'T! That goes double for men! (I don't know why, I just felt like being "controversial"). Don't literally climb onto the object of your affections, no matter how much you may want to "hit that". Don't openly gawk at an attractive person, it really pisses them off. Especially if you have a stupid look on your face. To catch a potential mate's attention, try to think of something charming and subtle, even if you don't know what those words mean. For the most part Kathy I like your spin on things. I must think about (after a very large bowl of Espresso) opening an "ADVENTURER EXFOLIATION STATION" somewhere in Ehb. However having to be polite and not jump on objects of my desire without first saying something polite worries me. So comments like "I like your bat and balls" or "I like the way you swing your bat" while standing in the men's shower after a baseball game would not be right. Commenting to the farmer while swimming in a lake "That is a very nice egg plant you have there" would also be wrong. Not altogether true DE, This adventurer would date them. I would even go to dinner and a movie with a goblin. I wonder if you can get a wood chip in someplace incontinent from a dryad or catch termites! Dwarves may all look male, but those beards are deceptive. I think the balding dwarves are the guys. I wouldn't check any further than beards, though. Those short folk pack a wallop! Head Clubber. And when you want to contact you can have a little club hit the contact button. But siege the date sounds coolest. Club is also handy for clubbing jerks over the head. Not that I would do such a thing. Yes it does. Looking back I guess head clubbing sounds misogynistic. I'm sorry for that. I didn't mean it as such. Should have put more thought into it. Please forgive me. 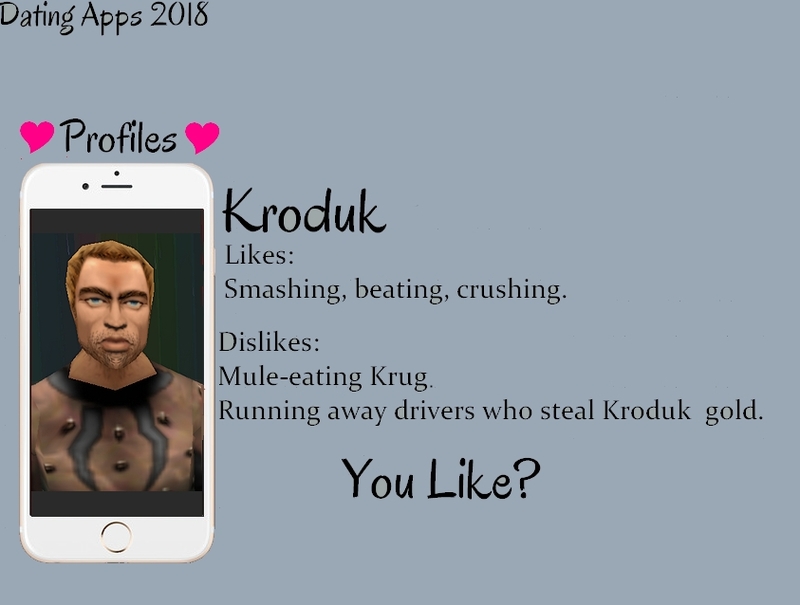 A dungeon siege dating app is a wonderful idea. I didn't think you meant anything bad with your comment and was not offended in the least. I was just goofing on the idea of clubbing "bad" dates over the head. Especially the ones who repeatedly call me "babe" or say "hey babe" as well as any other variations on the word Babe such as "babealicious". I usually say something like "Sir, I am not the fruit of your loins, nor a cuddly piglet from that 90's movie. I am not your Babe!" Or I am less formal and yell "Oi! Eyes up here Mister Man!!" Everything is an app. Unfortunately I've picked this term up from web development and call everything an app. I didn't know you're from Mass. Kathy. Wicked pissah. I'm originally from CT and moved to the South. Hmm, I call women pet names I've picked up in the South. They respond well to it. I don't say babe though. Sounds stupid. Edit: I have the skills to make us a dungeon siege dating app, but we lack people . I also wouldn't use it. The male to female ratio on dating apps is awful. Yup, I am what is (affectionately ??? ) known as a "Masshole" and thus condemned by the inferior (hahaha) states about "our" bad driving. I will say this though, I have never, ever received a speeding ticket. I just dislike the whole calling dates "babe" each and every time the guy speaks or doing something similar to that. It just seems disrespectful like -"Pssh, I can't be bothered to learn your name" or "I'm dating 3 girls so I'mma call them all babe." I guess if someone has memory problems that's different though. I'm actually relieved that this dating stuff is over. Between my ex-husband and I breaking up and my current boyfriend...Well, it was not a very fun time. I can get the dates easy enough, the hard part is what the hell to talk about? I can muddle through a short-ish conversation, but sometimes those ensuing silences seem awfully long. Gack! Not gonna lie, I would have stayed on a dinner date just to have a nice meal. I know, it seems like a mean thing to do, but if the guy is a jerk and I'm really hungry...I'm only human, you know! You are not wicked Kathy you are actually smart. Get a free nice meal just having to listen and look at a dork for an hour or so. I was stupid for not staying for the dinner after the guy called me babe. I guess it would not have be so bad to listen to him talk about him self for the length of the dinner. That way I would not have to tell him anything about me.